There was one line that stood out in David Einhorn's Q2 letter to investors: "our results have been far worse than we could have imagined, and it’s been a bull market to boot." And looking at the fund's just released 13F, we may have an idea why. 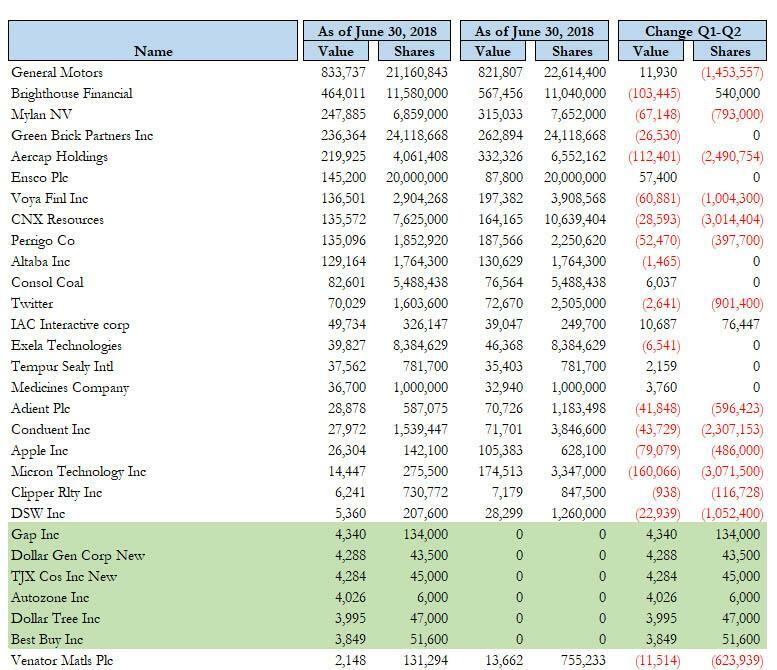 In the second quarter, Einhorn's Greenlight Capital, which saw its reported long positions shrink from $4 billion as of March 31, 2018 to just $3.1 billion on June 30, 2018, slashed the bulk of his Apple stake, or some 78%, from 628,100 shares or a value of $105.4 million as of March 31, to 142,100 shares, leaving Greenlight with only $26.3 million as of the end of Q2. This is unfortunate because in the third quarter, AAPL soared another 13%. Meanwhile, Einhorn's top positions, General Motors and Brighthouse Financial have both lost value in the third quarter. One presumes that the reason behind the trimming of the highly liquid AAPL position was the need to satisfy redemption requests. Meanwhile, what is not shown in the 13F is the biggest source of P&L loss for Einhorn, his short basked, and especially his Tesla short. The result, as we noted last month, is that Greenlight’s main fund lost 0.3% in July, and its total loss for the first half was 19%.